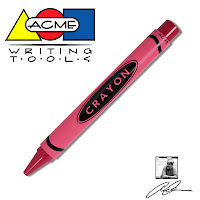 The Mod Mommy: Acme Writing Tools Crayon Pen--Your Kids Will Think You're Pretty Darn Cool! Oh, the joys of being a kid again. Unfortunately, we have to work, take care of the kids, and pay the bills. Well, if you're going to be doing that kind of stuff anyway, why not feel like a kid again? Write your bills each month with this supercool crayon pen from Acme Writing Tools. Available in a number of fun, bright colors, the Acme Crayon Pen is a retractable, refillable pen that lets you look like a kid but write like an adult! Refills for the Acme Crayon Pen are extremely affordable, which means you will be signing contracts, writing checks and completing thank you notes for ages with this awesome pen!